Below are all the laureates since the year of my birth. I think I’ve read less than half of them, and some of them – like the Quasimodo guy from my yob – I’ve never even heard of. Also, I find it strange that so many of them are best known for writing drama. Except maybe for Marquez, none of them have given me one of those unforgettable literary moments we all cherish. Although a few of the ones predating 1959 have, like Pasternak, Laxness, Hemingway Mann and Lagerlöf. Is any one of them a favourite of yours? What have you read? Why did you think it was wonderful? I’d really like to know! Uh, we’ve been so busy since my last post, I don’t even know where to begin. The Rainforest Habitat is a 10 minutes walk from our dwellings, so we thought that would be a good place to start. And this place was even better than the Koala sanctuary we visited outside Brisbane. Not as many koalas, but many more cute kangaroos and hundreds of birds, many of them quite tame. It was yet another encounter with the incredible diversity of our planet and again, it made a huge impact on us. Dane is contemplating becoming a vegetarian – he just can’t bear the thought of us killing all those cute animals and fish just to eat them, now that he’s seen so many of them up close and personal. It being Valentine’s Day and all (just another excuse for some exclusive dining), we decided to try out one of the better restaurants in Port Douglas. 2 Fish. That turned out to be an excellent choice. Lovely food, nice service. The fish was fantastic, the desserts to die for. The evening became even more exotic, because it rained the tropical way, in buckets with lots of thunder and lightning. And we sat outside, just under a tarpaulin, so we could hardly hear oneanother speak. The next morning we went on our much anticipated boat trip to the Great Barrier Reef. 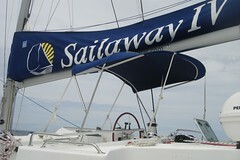 We’d chosen a brand new katamaran, the Sailaway IV, that does a family-friendly trip to a place called the Low Isles. Sort of like in Castaway, but with a return ticket. There were only 7 other passengers and they were all very civilised (=middle aged ;-) ). The trip out to the reef (by motor) took a little over an hour and then we were sailed in to the island on a small glass-bottomed boat. From there on it was just to snorkle away from the beach. It was only a few strokes, then you were on the reef and there were thousands of fish in all shapes and colours. Just marvellous! Dane wasn’t too keen on snorkling on his own, so he got a ride on mommy’s back and we found Nemo in his anemone. Today we went on a different kind of rain forest tour – we went with an indigenous guide, an aboriginee from the Kuku Yalanji tribe. He told us about the way the ancestors had perused the rainforest and we tasted some very nice bread, baked with flour made out of the nuts from a tree in the forest. Interestingly, the nuts has to be cleansed in the river for 7 days, because otherwise they are poisonous. At the end of the tour, he played us a couple of tunes on his didgeridoo. He was very good at it and had Dane mesmerized. Then we went for a much needed swim in the Mossman Gorge, a lively river with very cool water. No crocs, no stingers = lots of locals! The afternoon was spent driving up along the coast and stopping every 10 minutes for yet another photo opportunity! Quite a few more photos here. I like it. Most of the time the Americans seem very unoriginal when they name their towns. We must have passed at least a dozen Madisons, Columbus’, Fredericksburgs, Hoovers and Lebanons. We’re wondering a little bit about the Lebanons. Why is that name so popular? But Rising Sun, isn’t that just lovely? We also passed a town called Satan’s Kingdom (Vermont) – I don’t really believe in Hell or Satan or any of that, but still wouldn’t like to live there! And try to picture this: I arrive at an isolated spot by a beautiful lake in the mountains and say: Oh, it’s lovely here, I’ll settle with my family and I’ll call it Satan’s Kingdom??? By the way, early on in our travels I believe I wrote that my American family lives out in the sticks in the Texas hill country. I take that back. Where they live it’s litterally urban compared to rural Vermont or rural Ohio! Today’s campsite is lovely. It’s right on the Ohio River (which forms the state line between Indiana and Kentucky) and David is thrilled to bits. The people here are very nice and friendly – they haven’t had any real Europeans (as opposed to Americans with a German grandmother) before, so we are a real novelty, totally exotic! We just drove past Seagram’s Distillery, a huge factory complex which let out an awful smell and had stood there since 1857. That made us wish for G&T’s, but would you believe it? In Indiana they won’t sell you alcohol on a Sunday! Must be because we’re now in the bible belt, all though I don’t seem to remember any such restrictions in the Carolinas. 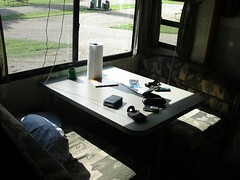 Anyway – we’ll stick to the beer we already had in the RV and hold our gin-craving till tomorrow. Dane is also very happy today. 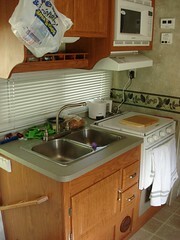 In the camper next door is a little boy from Tennessee, who’s just as thirsty after a playmate as Dane is. So they are playing away – it’ll be hard to get them to bed, but luckily they can play again tomorrow. Huge barges sail by all the time. This river isn’t just for fishing and fun! We’ve had an ongoing thing on our trip. David seems to have a hidden repertoire of old pop songs with references to American states, towns or rivers. And he drives along and sings happily. For those of you who know him well enough to have heard him sing, feel free to imagine. The first time he burst out in song was when we were headed for Galveston. And today he remembered Olivia Newton-John with The Banks of the Ohio. This clip is just so funny! Today we were really going to treat Dane to something special, so we took the relatively long drive down to San Antonio to the worlds largest Sea World. But, eh, it was closed… So much for Internet research! 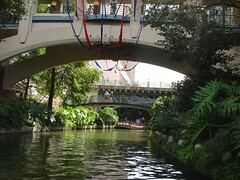 Instead we went to downtown San Antonio to see the Alamo and take a boat trip on the river. 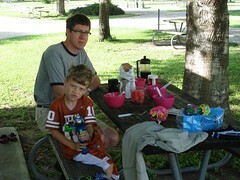 We started with some much deserved lunch and then we went on the half hour boatride on San Antonio River. It was quite a nice ride with pretty views. The guide was very funny – at least he thought so himself. 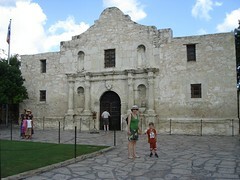 And so – the Alamo! You can’t see it until you’re right in front of it – it doesn’t seem like much, dwarfed as it is among many new and tall buildings. But it was an experience never the less. The Americans are so proud of the courageous soldiers, who were defeated here. It is a good place to come and feel the positive sides of American patriotism. We bought a few silly souvenirs and decided to call it a day – half wasted because of the closed Sea World. It is now quite clear that almost all summer-related entertainment ends at Labour Day. We came to the US one day later… Anyway, we didn’t come here to rush from one theme park to the next, but we really would have loved to see the worlds largest Seaworld with a real killer whale! 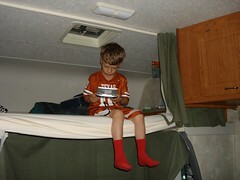 Dane on bunk bed playing his gameboy. Moments later he fell down – he is so preoccupied and wriggles around so much when he’s playing, that he doesn’t pay attention. Auch. 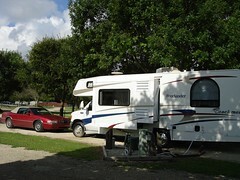 Previous posts about our road trip in the US (only a couple) can be found here. This is my new blog. I’m just learning, so have patience. If you’re one of my “regulars”, please reverse to my old blog until further notice! Udgivet i august 16, 2007 Kategorier Ikke-kategoriseretTags Ikke kategoriseret1 kommentar til Hallo!